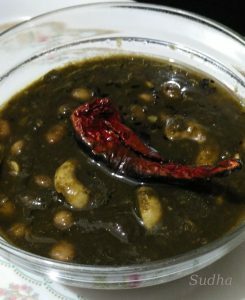 This is a Maharashtrian Delicacy. 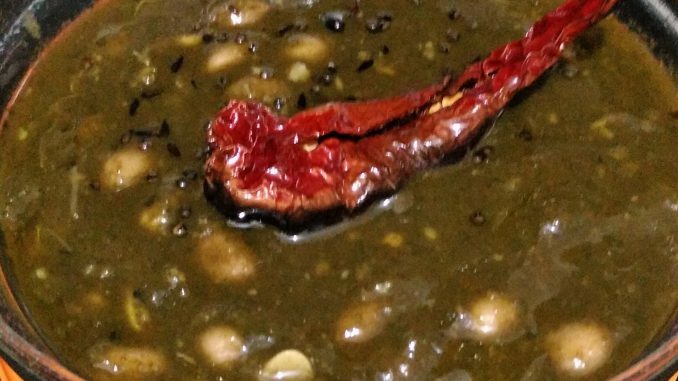 It’s very tasty – Sweet and sour taste as Tamarind and Jaggery is used in this preparation. There are 2 types of Alu (Colocasia / Taro) leaves : (1) one with light brown colour stem and (2) one with dark brown colour stem. Use the ones with light brown stem for this recipe. If you can’t recognise the type, ask the subjiwala to give you “Subjiwala Alu Leaves”. 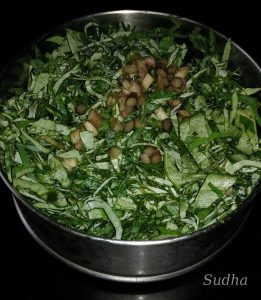 This subji is also known by a funny name ‘Alu Fadfade (फदफदं)’. 2. 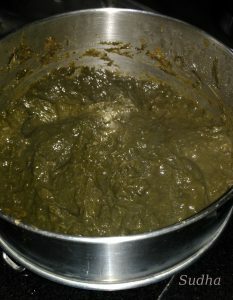 Wash Alu leaves and chop fine. Peel off the skin from stems and chop them fine. Generally your palms will get itching sensation after handling Alu. Rub Tamarind or Kokum on your palms and then wash with water. Itching will stop. 3. Pressure cook chopped Alu leaves and stem together without adding any water. Pressure cook Cashew Nuts along with Alu but put it in a separate bowl. Add ½ cup water to Cashew Nuts while steaming. 4. Pressure cook Peanuts till soft. Add ¾ to 1 cup of water to Peanuts while steaming. It takes long for Peanuts to cook. 5. When Steamed Alu Leaves are warm, mash them with a spoon into a smooth paste. 6. Add rice flour and mix well. 7. Heat oil in a pan on medium flame. 8. Add mustard seeds , wait till sputter. Add Turmeric Powder and Asafoetida (Hing). 9. Add slit red chillies, curry leaves (kadipatta) and fenugreek (methi) seeds. 11. Add steamed Peanuts and Cashew Nuts. 13. Add salt, jaggery, goda masala, tamarind (chinch) and scraped coconut. 14. Bring the mixture to boil. 15. Delicious Alu Bhaaji is ready. Serve hot with Roti or Rice.